Fingerprint Gallery presents artist Liu Yazhou’s solo project “Picking Wastage” in Beijing and the main focus of this exhibition is on the artist’s recent works of installation and sculpture. Some of the works in the exhibition “Picking Wastage” were collected from real life, others were created based on real life references. These works are not only the basic components of this exhibition, they are also intended to juxtapose “two situations” at the same time — reflect life from a fine art perspective, and to understand art from a real life perspective. The fundamental meaning of “Picking Wastage” is searching reality. In this exhibition, it implies the artist’s creations are based on a working method that has developed through real life experiences. The meaning of “Wastage” in society not only represents abandonment and edge, but also represents absurdity and uncertainty in the day-to-day life; however “Picking” as an action, here as an artistic expression of relocating and rearranging the “Discovered Things”. 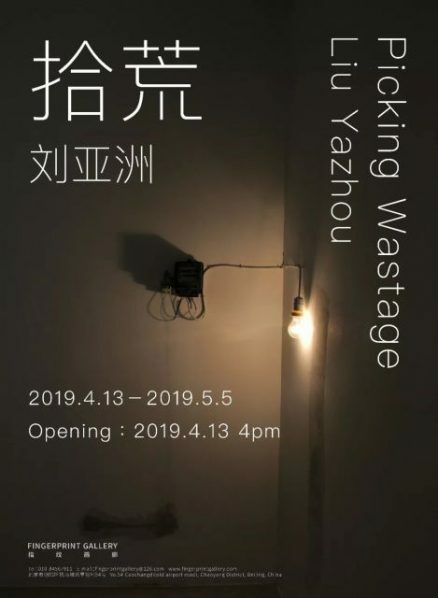 Put the two words of “Picking Wastage” together, it emphasises on the artist’s logic of “picking” and “reconfiguring” the things thatare being used in daily life. Therefore, it exhibits the creative concept and artistic expression. Courtesy of the artist and Fingerprint Gallery, for further information please visit http://fingerprintgallery.com.